Hunter Farms: 100 years of local and regional farming. Hunter Farms, maker of Harris Teeter Organic milk, is proud to be a Harris Teeter Home Town partner. We appreciate our role as a source for quality products and their positive impact on people’s nutritional health. Like Harris Teeter, we started as a small North Carolina business and through a dedication to our small community of neighbors and farmers 100 years ago, grew to our wonderful role as Harris Teeter’s store brand dairy. Hunter Farms gets milk from Producer Associations or Milk Cooperatives. 13,000 cows are milked to provide the plant with 645,000 lbs. or 75,000 gallons of milk—each day. That is approximately 50 lbs. or about 6 gallons of milk from each cow, every day, to keep consumers in milk and cookies. We even make orange juice—a lot of it—1 million gallons annually! 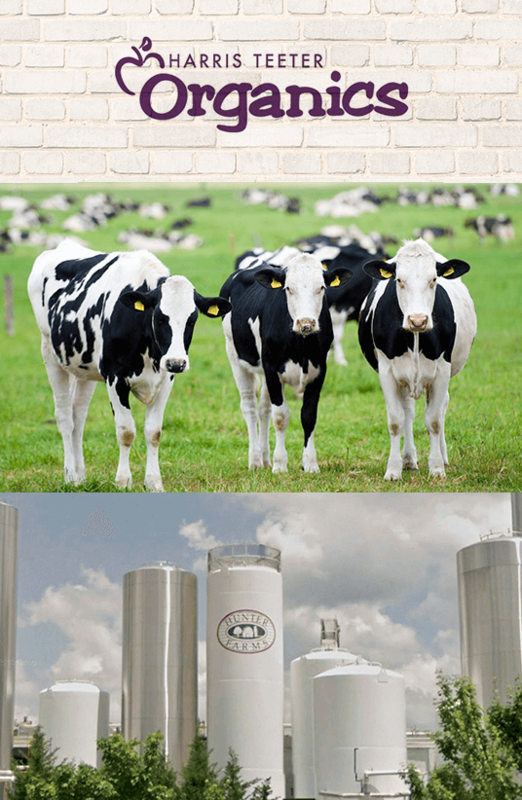 Hunter Farms works 24 hours-a-day, 5 days a week to turn out 7,200 gallons of milk per hour, 100,000 gallons per day, and that means about 22 million gallons per year. That includes; skim, half percent, 1%, 2%, whole milk, buttermilk, and chocolate milk. When it comes to ice cream, Hunter Farms produces 2.3 million gallons per year for Harris Teeter and other grocery stores. Hunter Farms also produces buttermilk for Hardee's and Frosty Mix for Wendy’s distributed in North Carolina, South Carolina, Georgia, Florida and Tennessee.